Dive into spa-velous bliss with this collection of berry nice hydrators and body wash/bubbling bath, in a limited-edition holiday scent. This set contains a snow berry hand cream, snow berry body butter and snow berry soapy suds. A perfectly packaged pair of mini Paint Pots to ensure your nails are impeccably polished this holiday season. Wear high coverage creme or gorgeous dazzling glitter on their own or layered together for a sparkling party look. The adorable packaging also doubles up as a Christmas ornament you could hang on your tree. Purity made simple one-step facial cleanser is Philosophy’s award-winning cleanser, loved by all for its multitasking, 3-in-1 approach to cleansing. Skin is left feeling perfectly clean, comfortable and balanced. The festive packaging makes it a must-hang on your Christmas tree too. Two different packagings of hand cream for different friends. For your sophisticated friend, you have choice of the Daily Perfume Hand Cream Set at S$15.90, which features a 3 piece hand cream. Select from 8 different flavours – Rose Water, Tiare, Apple Pop, Berry Mix, Green Tea, Cherry Blossom, Macadamia or Acacia Honey. On the right, you have the Mini Pet Hand Cream Set for the friend that loves everything sweet and cute. This 3 piece hand cream set is available in Baby Powder, White Floral and Fruity Floral. Hmmm, I wonder if Baby Powder would smell like a newborn’s head. Etude House comes up with the best and cutest packaging for gift sets. And this is a lovely stocking stuffer resembling a snowy dessert cake box. But no, that’s not a cake inside of its lip tint. Select from 5 fruity flavours such asSoft Strawberry, Bouncy Apricot, Sweet Grapefruit, Sticky Rich and Soft Apple. Or spoil your recipient and get her the whole collection. This Floral Fresh Petite Set from L’Occitane contains Revitalizing Fresh Shampoo, Revitalizing Fresh Conditioner, Cherry Blossom Shower Gel and Pivoine Flora Shower Gel. It’s travel-sized packaging makes it great to bring along during vacation. This set contains everything your buddy would need for a pampering warm bath. Packed in this super adorable festive gift box is a Bubble Bath Shower Gel, Velvet Body Lotion and Bath Flower Sponge. Though not something new since it was first launched last year. However, something this adorable never gets old. The presentation of this gift screams cuteness overload. 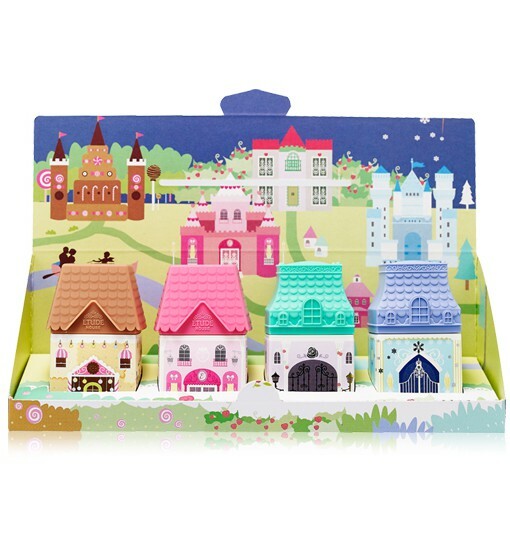 Each set comes with 4 My Castle hand creams in Pink Wish, Ice frozen, Sweet Cookie, Forever Rose. Make Up Forever high gloss lip lacquers in festive red and pink shades, comes with a unique spatula that holds as much product as possible, so you can load up your lips. This Laneige skincare set comes in a limited edition festive box and contains the Holiday BB Cushion, Clear C Advanced Effector, Power Essential Skin Refiner, Balancing Emulsion, Water Bank Gel Cream_EX, Water Bank Eye Gel, Water Sleeping Mask and Lip Sleeping Mask. All items are travel-sized so they are perfect for the jet-setting friend or someone whom you would like to introduce this brand to. Have a merry good time with Origins Make A Difference™ + Collection that helps skin retain a natural reservoir of hydration. The Collection features Make A Difference™ Plus+ Rejuvenating Treatment, Make A Difference™ Rejuvenating Cleansing Milk, Make A Difference™ Plus+ Rejuvenating Treatment Lotion and Make A Difference™ Plus+ Rejuvenating Serum all packed into a Origins Limited Edition 100% Recycled Cotton SM Bag. This sure is one gorgeous, elegant makeup set that comes with all the 6 essentials for a night out which makeup mavens would definitely love. And yes, the items come along with into the exclusive stud-embossed metallic evening bag. This entry was posted in Beauty, Fashion, Lifestyle, Makeup, Nails, Shopping, Skincare and tagged Bath and Body Sets, Beauty Christmas Edition, Bliss, Christmas 2015, Christmas Budget, Christmas Gift Suggestions, Christmas Presents, Christmas Stocking Stuffers, Ciate, Estee Lauder, Etude House, Hand Cream Sets, Laneige, Limited Edition Christmas Sets, Loccitane, Make Up Forever, Makeup Sets, Origins, Philosophy, Sephora, The Face Shop by Charlotte. Bookmark the permalink.